Total body irradiation (TBI) is a special radiotherapy technique, administered prior to bone marrow transplantation. Due to the complex nature of the treatment setup, in vivo dosimetry for TBI is mandatory to ensure proper delivery of the intended radiation dose throughout the body. Lithium fluoride (LiF) TLD-100 chips are used for the TBI in vivo dosimetry. Results obtained from the in vivo dosimetry of 20 patients are analyzed. Results obtained from forehead, abdomen, pelvis, and mediastinum showed a similar pattern with the average measured dose from 96 to 97% of the prescription dose. Extremities and chest received a dose greater than the prescription dose in many instances (more than 20% of measurements). Homogeneous dose delivery to the whole body is checked by calculating the mean dose with standard deviation for each fraction. Reasons for the difference between prescription dose and measured dose for each site are discussed. Dose homogeneity within ±10% is achieved using our in-house TBI protocol. Total body irradiation (TBI) is a radiotherapy technique mostly used as a part of the hematopoietic stem cell transplantation (HSCT). The role of TBI in conjunction with chemotherapeutic agents is to destroy malignant or genetically disordered cells and to immunosuppress the patient prior to HSCT. The immune system of the patients has to be suppressed prior to HSCT, which otherwise could reject the donor cells. Among the various modalities of patient preparation prior to bone marrow transplantation, TBI is advantageous compared to other methods for achieving a homogeneous dose delivery and for boosting or shielding the dose to any specific sites if required. TBI is a complex treatment procedure and differs from routine radiotherapy treatment techniques' inpatient setup, treatment distance, and field size. Hence, it is mandatory to monitor the accurate delivery of the prescribed dose during TBI through in vivo dosimetry checks. , Dosimetry for TBI is generally performed using silicon diodes or thermoluminescent dosimeters (TLDs). ,,, Accurate results can be obtained with lithium fluoride (LiF) TLD chips as their dependence on dose rate, direction, energy of the radiation beam, and temperature is less significant compared to the other available dosimeters like ionization chamber and semiconductor devices. It is recommended to analyze the in vivo dosimetry results carried out on a number of patients to check the efficiency of the technique being used. Though there have been a number of publications available on TBI in vivo dosimetry, the treatment technique used was not entirely similar among these studies. Most of the studies have used bilateral treatment fields with the patient lying in the supine position. Published results available on TBI in vivo dosimetry in the technique using Anterior to Posterior and Posterior to Anterior (AP-PA) treatment fields with the patient lying on the lateral decubitus position are rare. The objective of this study is to report and analyze the results of our in vivo dosimetry checks measured with TLD chips on TBI using AP-PA treatment fields. There are many different TBI techniques being practiced around the world. The choice of a technique in a particular hospital depends on many factors like available equipment, photon beam energy, maximum possible field size, patient dimension, and treatment distance. Specific treatment parameters to be determined include field size, collimator angle, treatment distance, dose per fraction, dose rate, total dose, number of fractions per day, interval between fractions, beam energy, geometry to achieve dose homogeneity, bolus or beam spoilers to increase skin dose, shielding, and dose compensation requirements (e.g., lungs, kidneys). In our hospital, AP-PA technique with 6 MV photon beam from linear accelerator (linac), Oncor Expression (Ms. Siemens, Erlangen, Germany) was used for TBI. Vacuum cushion was used to keep the patient immobilized in the treatment position during treatment execution. Patient was made to lie on one side in the vacuum cushion at a source to surface distance (SSD) of 400 cm. Collimator jaws were opened to a maximum field size of 40 × 40 cm 2 , with the collimator rotated to 45° so as to fully cover the patient body. Patients were asked to keep both arms across the chest and their fist over lung region of the chest to compensate for the tissue inhomogeneity in the lung. No separate blocks were used to shield lung, as it was difficult to introduce and match the blocks over lungs in the TBI technique with the patient lying on lateral decubitus position. A beam spoiler made of polymethylmethaacrylate (PMMA) of thickness 2 cm was introduced between the patient and the machine at a distance of around 50 cm from the patient surface to avoid the skin-sparing effect. Total prescribed dose of 12 Gy (150 cGy per fraction) was delivered to the patients over eight fractions of treatment in 4 days. Each day, two fractions of treatment were given with a gap of minimum 6 h. Treatment was delivered at a dose rate of 6 cGy/min at the treatment distance by setting 100 monitor units (MU)/min in linac. Number of MUs required to deliver the per field prescription dose of 75 cGy was in the range of 1300-1400 MUs depending on the average thickness of the patient. During patient preparation, anterior posterior (A-P) thickness was measured at forehead, neck, chest, abdomen, pelvis, thigh, knee, and ankle to calculate the average thickness of the patient. Dose was prescribed to the midplane depth of this calculated average thickness. Test dose of 20 cGy (10 cGy from anterior field and 10 cGy from posterior field) was delivered to the patients prior to treatment for dosimetric verification. TLD chips are the standard detector used for patient in vivo dosimetry in our TBI treatments. In vivo dosimetry was carried out by pasting TLD chips at multiple sites throughout the patient body to measure the dose received. After ensuring acceptable dose results from the test dose measurements, patients were taken up for further treatment. Radiation output and depth dose profiles of the linac measured at the TBI setup were used for the MU calculation. 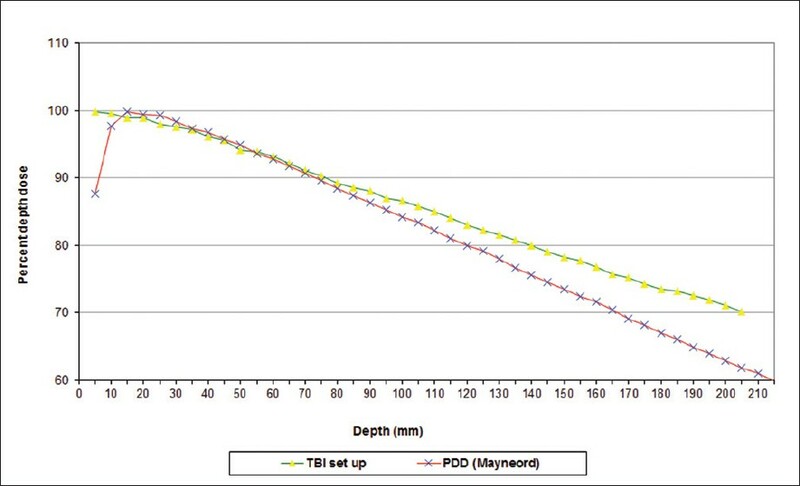 Percentage depth dose ( PDD) values measured for standard 100 cm SSD and converted for 400 cm SSD using the Mayneord factor differ from the actual PDD for TBI setup, as the difference in SSD is very large. Hence, it is recommended that a direct measurement of the PDD and output should be obtained at the TBI setup. RFA-300 radiation field analyzer (Scanditronix Wellhofer, Uppsala, Sweden) having mylar window on one wall was used to measure the PDD at the TBI setup. High-doped p-type silicon diodes (Hi-p Si) were used as the detectors. The reference detector was also kept beyond the beam spoiler (close to the phantom) in the same spectrum of beam energy. Accuracy of PDD data measured using diode was verified using gafchromic films at multiple depths (absolute measurement). PDD values generated using Mayneord factor for 400 cm SSD at every 5 mm were compared with the PDD values measured for TBI setup [Figure 1]. Difference between the two PDD curves was more significant at larger depths. Also, it was observed that for the PDD measured at TBI, the depth of dose maximum (d max ) had shifted to 4 mm depth compared to 15 mm depth for the PDD generated using Mayneord factor. Based on these observations, the bolus material to keep the TLD during in vivo dosimetry was made of 5 mm thickness to achieve buildup. Output measurement of the linac at the TBI distance was measured using solid water slabs (density: 1.03 g/cc) of dimensions 30 cm × 30 cm. Multiple solid water slabs were used to make a phantom of 20 cm thickness. A 0.6 cc cylindrical ionization chamber (PTW, Freiburg, Germany) with UNIDOS E electrometer was used for measurements. Care was taken to reduce the direct exposure to dosimetry cable to minimize the leakage. The ionization chamber was kept at a depth of 10 cm and irradiated with 500 MU. The meter reading obtained was used to calculate the radiation output using the PDD value obtained at 10 cm depth for TBI setup. IAEA TRS-398 formalism for output measurement of high-energy photon beams was used to calculate the output taking into account the ion recombination, polarity correction, and temperature and pressure correction. Two sets of LiF TLD-100 chips (Harshaw, Solon, OH, USA) of dimension 3.2 mm × 3.2 mm × 1 mm were used in this study. TLD chips were annealed at 400°C for 1 h using Fisher Scientific thermal furnace, followed by gradual cooling at room temperature. A semi-automatic TLD reader (Harshaw 3500) was used to read the response from the TLDs. Prior to start using the TLD chips for dosimetry, both sets of TLD chips were calibrated in order to establish dose as a function of TLD reading. Each TLD chip was allotted an identification name in the reader. All the TLDs were then annealed and irradiated with 6 MV photon at 5 cm depth in solid water phantom (density: 1.03 g/cc) with a 10 cm × 10 cm jaw opening in the linac at 100 cm SSD to a dose of 200 cGy. During TLD calibration and TBI in vivo dosimetry, TLDs were read 24 h post-irradiation. TLD chips showing response within ±1% of the mean response of the entire set were chosen as golden chips. After identifying the golden chips, TLD chips were again annealed and irradiated in the standard setup to a known dose. The reader response to these golden chips was used as the calibration factor for the TLD reader. [Figure 2] shows the glow curve obtained from the TLD reader during TLD calibration. The remaining TLD chips other than the golden chips, known as field dosimeters, were read to generate their unique calibration factors. These field dosimeters were then used as the detectors in TBI in vivo dosimetry. Dosimetry results of 20 TBI patients (aged between 3 years and 28 years) treated between March 2008 and December 2011 were analyzed in this study. Prescription depth ranged from 4.4 to 9.2 cm among these 20 patients. The intention of the in vivo dosimetry check was to ensure that the prescription dose was delivered accurately and uniformly throughout the patient's body. Sensitivity of the TLD has to be checked before using it on each patient. Hence, before using TLD for every TBI patient, both sets of TLDs were exposed to a known dose (200 cGy) at the standard setup used for TLD calibration. Subsequently, only those TLDs whose response fell within ±3% of the given dose during this sensitivity check were used for the in vivo dosimetry. TLDs were recalibrated if the whole set of TLDs showed more than 3% difference between the given dose and the measured dose during this sensitivity check. The measured dose values by each TLD set during the multiple sensitivity checks performed were averaged out and are shown in [Figure 3]. TLDs along with wax bolus over each TLD were kept at forehead, mediastinum, chest, abdomen, pelvis, thigh, and calf during in vivo dosimetry. Thickness of the bolus was maintained as 5 mm to achieve buildup region. 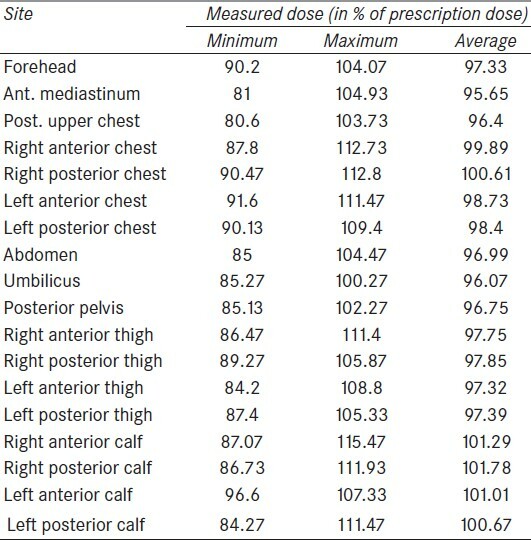 From the results, minimum, maximum, and average measured dose values at each anatomical site were analyzed. Prescription dose was divided into different ranges (<95%, 95-105%, and >105%), and an analysis was made for all sites on how many number of times the measured dose falls in each dose range. Mean dose to the whole body with standard deviation was calculated for each fraction of the treatment to check the homogeneity in the dose delivery. [Table 1] shows the minimum, maximum, and average measured dose at each site. Due to the large variation in body thickness and internal tissue heterogeneities, the minimum dose and maximum dose measured at each site had a significant variation (>10%) from the prescription dose. However, an analysis on the average measured dose from each site among the whole data set reveals that the average dose to each site falls between 96% and 102% of the prescription dose. Results obtained from the TLD kept on the patient's forehead show an average measured dose value of 97.33%. The average measured dose at mediastinum was 96%, with 95.65% at the anterior mediastinum and 96.4% at the posterior upper chest. The average dose to chest from the four TLDs used on chest was 99.4%. Dose measured at the right chest was found to be about 1% higher than the dose measured at the left chest. Dose recorded from abdomen and pelvis followed similar patterns. The average measured dose levels at umbilicus, posterior pelvis, and abdomen were 96.07%, 96.75%, and 96.99%, respectively. Eight TLDs were used for the legs, four on the thigh and four on the calf. The average measured dose values to thigh and calf were 97% and 101%, respectively. It is observed that the minimum and maximum dose measured at each site varied significantly from the average dose for that site (e.g., the difference between average dose and minimum dose for left posterior calf was more than 16%). Hence, to understand how frequently the dose measured at each site is deviating from the average dose, results for each site are distributed into different dose ranges [Table 2]. An analysis of the same would give an idea on what dose shall be expected from each site. In most of the instances (more than 80% of the time), the dose measured at mediastinum, abdomen, forehead, and pelvis falls between 95% and 105% of the prescription dose. This pattern was followed by thigh (68.8%), chest (66.3%), and calf (65.9%) for recording 95-105% of the prescription dose. Though the minimum dose for each site from the whole data is below 95% of the prescribed dose, this occurred on a few occasions only (6.5-19.2% of the measurement times for different sites). The prescription depth is significantly different from the midline depth for sites like pelvis and calf, as the dose is prescribed to the midline depth of the patient's average body thickness. When the thickness of the pelvis is larger than the average patient thickness, a lesser dose is expected to be measured from the TLDs kept on pelvis. Thus, TLDs kept in pelvic region recorded a dose less than 95% of the prescription dose on more occasions compared to TLDs from other sites. In spite of the proper instructions given to patients, on few occasions, there is a possibility of patient movement during the treatment due to the long duration of the treatment time. This movement of the patient can also result in a significant variation in the measured dose. Measurements at many sites, particularly chest and pelvis, correlated well with the study results of Lancaster et al. Dose to chest in our measurements was 99.4% compared to 99.3% in their measurements using semiconductor diodes. Dose levels measured on pelvis, abdomen, and head showed the lowest agreement with the study by Lancaster et al. Similarly, these are the sites in which the dose measured was less than 95% of the prescribed dose on more occasions in our measurements. Homogeneous dose delivery to the whole body is a requirement in TBI. To check the uniformity in dose delivery, mean dose of the doses measured from all sites was calculated with standard deviation for each patient. The standard deviation is given in cGy, and it indicates the variation to which the dose is delivered uniformly throughout the body. The mean dose to whole body (135.5-151.7 cGy) was close to the prescription dose for most patients and was within ±10% of the prescription dose for all patients in our TBI in vivo dosimetry. The standard deviation values were observed to be between 6.4 cGy and 18.3 cGy. 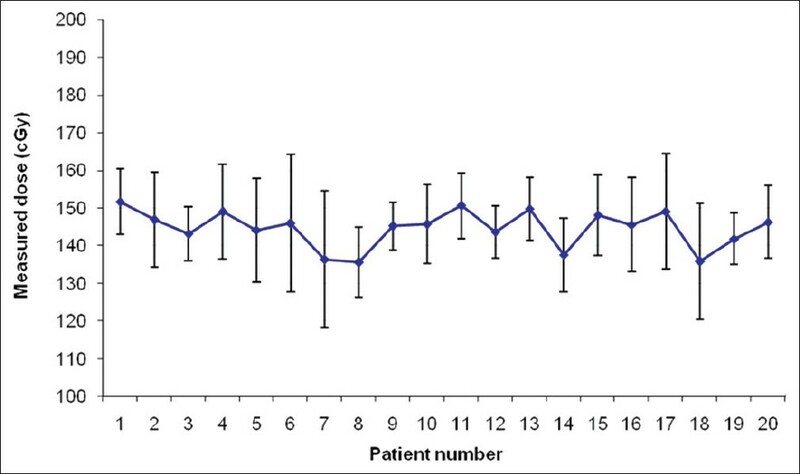 [Figure 4] shows the mean dose with standard deviation values calculated for all patients. Though dose homogeneity along the body axis within ±10% is acceptable for most of the TBI protocols, this was significantly worse compared to the in vivo dosimetry results reported by Palkoskovα et al. The main factor worsening the dose homogeneity in the technique used in our TBI protocol was the dose to extremities and chest. The TBI treatment protocol used in this study is simple and easy to implement. In any single fraction of TBI with the treatment technique used in this study, a dose within ±5% of the prescription dose is expected to be measured from all the sites except calf and chest when TLD is used for the in vivo dosimetry. The practice of using LiF TLD-100 for in vivo dosimetry is a good option for TBI dosimetry. The same could be used in similar quality assurance checks for other techniques in radiotherapy, if the TLDs are properly calibrated and checked for the particular technique. With our in-house TBI protocol of AP-PA fields with 6 MV photon beams, 10% dose homogeneity was achieved consistently. A better homogeneity in dose delivery is possible by adding tissue compensators for extremities and chest. Also, accurate and more consistent results could be expected if a detector which has less uncertainty in measuring the delivered dose is used. With this observation, we have started exploring the use of GAFCHROMIC EBT2 film by using the film along with TLD in our TBI dosimetry, and the results can be analyzed to standardize the technique in future. 1. Kirby TH, Hanson WF, Cates DA. Verification of total body photon irradiation dosimetry techniques. Med Phys 1988;15:364-9. 2. Van Dyk J, Galvin JM, Glasgow GW, Podgorsak E. The physical aspects of total and half body irradiation. AAPM Report No. 17. New York: American Inst. Phys.;1986. 3. Lancaster CM, Crosbie JC, Davis SR. In-vivo dosimetry from total body irradiation patients (2000-2006): Results and analysis. Australas Phys Eng Sci Med 2008;31:191-5. 4. Mangili P, Fiorino C, Rosso A, Cattaneo GM, Parisi R, Villa E, et al. In-vivo dosimetry by diode semiconductors in combination with portal films during TBI: Reporting a 5-year clinical experience. Radiother Oncol 1999;52:269-76. 5. Ribas M, Jornet N, Eudaldo T, Carabante D, Duch MA, Ginjaume M, et al. Midplane dose determination during total body irradiation using in vivo dosimetry. Radiother Oncol 1998;49:91-8. 6. Palkosková P, Hlavata H, Dvorák P, Novotný J, Novotný J Jr. In vivo thermoluminescence dosimetry for total body irradiation. Radiat Prot Dosimetry 2002;101:597-9. 7. Kirby TH, Hanson WF, Johnston DA. Uncertainty analysis of absorbed dose calculations from thermoluminescence dosimeters. Med Phys 1992;19:1427-33. 8. Quast U. Whole body radiotherapy: A TBI-guideline. J Med Phys 2006;31:5-12. Ravichandran, R., Binukumar, J.P., Davis, C.A., Balakrishnan, R., Al Mandhari, Z.
Ganapathy, K., Kurup, P.G.G., Murali, V., Muthukumaran, M., Velmurugan, J.